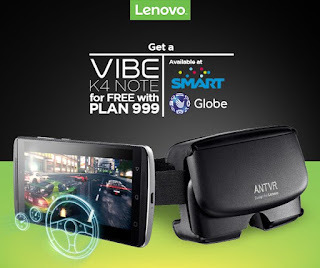 To all Lenovo fans here in the Philippines, Smart and Globe now offers the much awaited Lenovo Vibe K4 Note on postpaid under plan pricing of 999 monthly. The device released early this year and finally came out here in the country just this month. Lenovo K4 Note has 5.5 IPS screen display with full HD resolution and protected with Corning Gorilla Glass 3. It is also powered with 1.3 GHz octa-core processor from Mediatek and Mali-T720MP3. This device has 2 models, the A7010 a48 and A7010 that only differs in amount of RAM and internal storage space. You can take good quality picture on this device sports a 13-megapixels rear camera with dual LED flash and 5MP for selfie front facing camera. If you want to get this phone via Globe Postpaid below is the possible inclusion you can get under 24 months lock in period. If you want apply this smartphone via Smart Postpaid you may get the following inclusions below. Both network includes more services, above is just an overview of what you can get on that plan amount. Hopefully they will include free VR Glass on this plan also. I got this unit with free ANT VR for this price of 10,200 on one of the known online store in Philippines. I'll be posting a quick review of Lenovo Vibe K4 Note soon. You can throw your questions and other queries regarding this device on the comment box below. Do you know what model(A7010 a48 or A7010) is available in GLobe? Cause I'm planning to get this handset(3GB RAM).